LUXURY!! BIG RIGS! CASINO! SMOKIES! THE beautiful new Big Rig Resort in the heart of the Great Smokies-Treat Yourself! Unparalleled beauty & breathtaking waterfalls, lakes, streams & valleys. Harrah's across the street. Relaxing pool. WHAT ARE YOU WAITING FOR?? We wanted to get away for a week from home, so we review several campgrounds around the area. There was just something about the website that kept bring me back to here. When we pulled in, we greeted so warmly, I knew they we had made a great choice. We only of a few in after Christmas, but it was still an amazing place. The campgrounds is new and still be worked on to make it even better than what it was already. They have a spacious and very nice lodge. The bathrooms were well maintained. You are located across the road from a casino. Close to some very quaint towns. Grocery and Walmart very close by. You are only a few hours to other places like Pigeon Forge, Gatlinburg, Ashville. This place is wonderful and we will be back. The staff was incredibility nice and helpful. We visited the RV park driving back to Atlanta from Pigeon Forge (we had friends staying there). We were considering a month long rental and were a little on the fence about staying there due to the reviews and wanted to see it for ourselves. My first impression was “so-so”. Because our friends were there we decided to give it a try. My husband went to the office to reserve the space next door to them with plans to bring our camper the next day. When he went to the office he was informed that site next door to them wasn’t available (understandable) however another space nearby was (we couldn’t see that site from their camper). He paid for the site. We went directly to the site and discovered it was completely surrounded by mud (sparse grass, a huge dirt wall imbankment that was certain to flood the site with more mud and dirt when it rained - no silt fence to stop the mud slide). We went DIRECTLY back to the office in the time it takes to drive to the site and drive directly back to the office. I informed the manager that we couldn’t take the site because it it essentially a mud hole and we have a 5/7 year old boys and there’s literally no way to keep them out of the mud (they would have been isolated to about 20% of the concrete pad or the street) She informed me we would be charged a 1 week rental for the 5 minute later cancellation (yep you read that correctly). This of course was ridiculous bc we went directly to the site and directly back to the office and informed her we couldn’t use it due to the mud conditions. You couldn’t access the power/water connections without walking thru mud and mud completely surrounded the concrete pad. We were back in the office within 5-7 minutes tops of making the reservation!! Her only comment was “its not a mud hole” and “I explained the cancellation policy to your husband” WOW talk about a serious deficiency in customer service, professionalism and a lack of understanding consumers rights. Imagine checking into a hotel and walking to the hotel room in finding conditions existed that made it impossible for you to use the room and going back to the office and being told you were going to be charged for it anyway. Fortunately our bank understands consumer rights to actually receive a usable service (which clearly we did not and couldn’t use the lot offered). To have our bank solve this when she clearly should have cancelled the transaction is beyond ridiculous. We are talking 5 minutes later and immediately returning to the office after looking at the muddy site. That’s not a cancellation policy that’s borderline theft and hyjacking a customers credit card. This was not a reservation made and we were just unable to arrive as planned.....(that would have been understandable) This was a walk in the office, reserve a space, go look at it and see it’s a mess and we won’t put our camper on it scenario bc of the site conditions.... Any reputable business would have apologized and canceled the charges immediately. Instead we were told a one week cancellation fee would be charged (laughable)!! Worth noting is that my credit card was charged $695 (595 + 100) immediately. And while we were back in the office immediately (we didn’t even have our camper with us) no refund or adjustment has been applied my Valley River. My bank has instructed me that they will reverse the charges because of course they know it’s a joke. What a shame that Bank of America has to fix their incompetence. I am a business owner and employee managers to manage real estate projects. No way would I ever leave this lacking manager in charge of my real estate office. She expressed zero concern, zero professionalism and was defensive about the conditions. Literally her only words were “It’s not a mud hole” and “I explained our cancellation policy to your husband”. 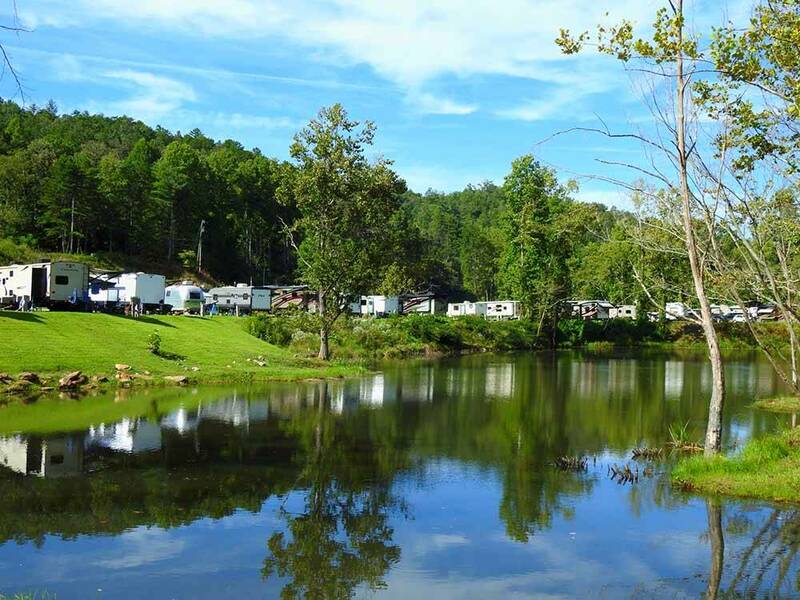 I’m sure the few positive reviews found on this RV Park were solicited (as suggested in one of the actual reviews) Campers are mostly a friendly group of folks that want to enjoy the outdoors and spend time with friends. I consider myself and my family part of that group. I’ve never witnessed an RV Park, hotel or otherwise quote a cancellation policy instead of immediately canceling a transaction (even apologize) for the situation. I am so thankful we had not hauled our 40’ camper the 3 hour drive there before seeing the actual site. This RV Park may be “up and coming”. The clubhouse and pool looked nice. The campsites near the front seem to get attention however the ones in the back where they are adding on a second section are not and it is a muddy mess. The “pond” is a drainage pond causing a huge infestation of gnats and mosquitos (not a pest problem typically associated with the mountains). The standing stagnant water and mud are a breeding ground. Be prepared to stay indoors or swallow them by the mouthful. No fire pits No room on the pad No playground Drainage pond is not fenced and offers a steep drop off I would definitely NOT consider this an option for mountain getaway. There are plenty of far better choices nearby with reputable business practices. Things could be better a year or so after this review “if” there has been a change in management and a dedicated effort to control the mud and deal with the stagnant water. We might have given this place another chance later once they had an opportunity to address the physical issues understanding some things go hand in hand with construction.... however the poor, lack of professional handling and poor guest services and the take away feeling of being ripped off ensures we won’t return. This will be a great place when it is completed. The host/employees are the most professional/friendliest that we have met at any campground so far. They want you at their campground and want you back. We felt like part of their family. We arrived after hours and when we pulled in our spot, here came the hosts with flashlights and just started helping us set up. What a breath of fresh air this place is. Before you stay, check with them by phone or email and see what parts of the resort are actually finished so there will not be any disappointment or misunderstanding. We already knew since we stopped in on a recent road trip. Highly recommend this campground. We stayed at site 42 in a 27 Ft. Class C with 1 slide out. Overview: This was a very difficult Campground to review due to the fact most of it was under construction. This review is based on what was available at the time of our stay and more recent reviews should be taken into consideration. Pros: Very beautiful Clubhouse. The folks that work there were definitely excited about the prospects of this Campground. They were very knowledgeable of the surrounding area as far as attractions and events. Harrahs Casino was near by. Walking to it was not easy. It was across the street as the web site says. But what it does not tell you is the street is a 4 lane Highway, and the Casino is about another quarter mile up a very steep hill (Mountain?) Cons: Very muddy due to the construction and lack of grass. To call this a Resort at this time would be stretching it a bit. The Fitness room, Pool, Restroom and Laundry building were under construction. No dog park, and walking the dogs was a muddy mess! I would say the lake is more of a large pond with muddy banks on the RV sites side. I would not fish from there but you could fish on the Clubhouse side with no problem. The above is true as of Nov and Dec, 2017 time frame. If their proposed Future RV Resort pans out I'm sure this will in fact be a great place to stay. When making reservations or calling about vacancies I would definitely ask what is available as far as amenities go. Me and my family had a great time during our stay at Valley River. The staff was very kind and friendly, the grounds were gorgeous and it was nice only being just across the street from the casino! I couldn't recommend this place high enough. Me and my family will definitely be back!